In determining which shows were worthy of this title, I had to make a few natural exclusions. Porgy And Bess, the Gershwins’ oft-revived masterpiece that had a stint on Broadway last year was definitely not eligible. Neither was the Pulitzer Prize winning Of Thee I Sing, which gets performed often enough. (An Orlando high school did a production of it last year.) And to make things more interesting, the shows that inspired My One And Only, Crazy For You, and Nice Work If You Can Get It – Funny Face, Girl Crazy, and Oh, Kay! respectively — are excluded. If I had chosen to include them, those would actually be my top three choices. So those are the only five musicals that you will not see in these next three weeks. Any other Gershwin Brothers musical is a possibility! Okay, so maybe you’ve heard of the Garland-Rooney MGM spectacle of the same name. Or maybe you’ve heard the catchy title tune, later adopted as UCLA’s fight song. But you probably aren’t familiar with the plot, the entire scope of the score, or the drastic revisions that occurred during the show’s laborious three year development. Strike Up The Band was a satirical piece that took aim at American sentiments regarding war and business. The book was written by renowned playwright George S. Kaufman and had it’s world premiere in New Jersey during late August of 1927. This was the original story: When Congress levies a 50 percent tariff on imported cheese, Harrison J. Fletcher, the owner of a large cheese factory, agrees to personally bankroll a war against Switzerland, who has challenged the new tariff. Colonel Holmes, the President’s advisor, agrees with his proposition; after all, this war could be good for his upcoming book sales. Meanwhile, Fletcher’s daughter Joan (engaged to Sloane, the factory’s manager) falls in love with Jim, a reporter who publicly denounces the war and her father’s cheese. Meanwhile, an overbearing widow, Mrs. Draper, puts the moves on Fletcher, while her wisecracking daughter Anne romances Tommy, the factory’s foreman. Congress officially declares war and the show moves to Switzerland where Jim has now taken a job in the army kitchen to be near Joan. Meanwhile, Anne hopes to get her mother off her hands so she can focus on her relationship with Tommy, and tells both Fletcher and Colonel Holmes that her mother is worth millions. As both men fight over Mrs. Draper, Jim realizes that Sloane has been secretly cutting the buttons off all the American soldiers’ uniforms. Based on that nugget of information, America wins the war and the troops returns home. Mrs. Draper reveals she has no fortune, but Fletcher decides to stay with her regardless. Meanwhile Jim learns that Sloane is actually a member of the Swiss secret service, and the public declares Jim a war hero. Colonel Holmes reunites with his son, an American secret agent, and all the couples end up in each other’s arms. That is, until Russia issues a complaint about a newly issued tariff on caviar. Fletcher has just bought shares of American caviar and calls for immediate action as the title number is reprised. Whew. In addition to the rousing title tune, other standout numbers included secondary couple Anne and Timothy’s first duet, “Seventeen And Twenty-One”, Timothy’s toe-tapping “Yankee Doodle Rhythm”, and a number for the soldiers returning home, the enchanting “Homeward Bound.” But perhaps the most famous number included in the 1927 production was “The Man I Love”, originally cut from 1924’s Lady, Be Good! In these tryouts, critics praised the show’s wit and originality, but found the book long and tedious. Modern scholars argue that the characters in this edition are not as nuanced or motivated as they should be, and that the charm of the score sometimes contrasts the biting satire of the book. 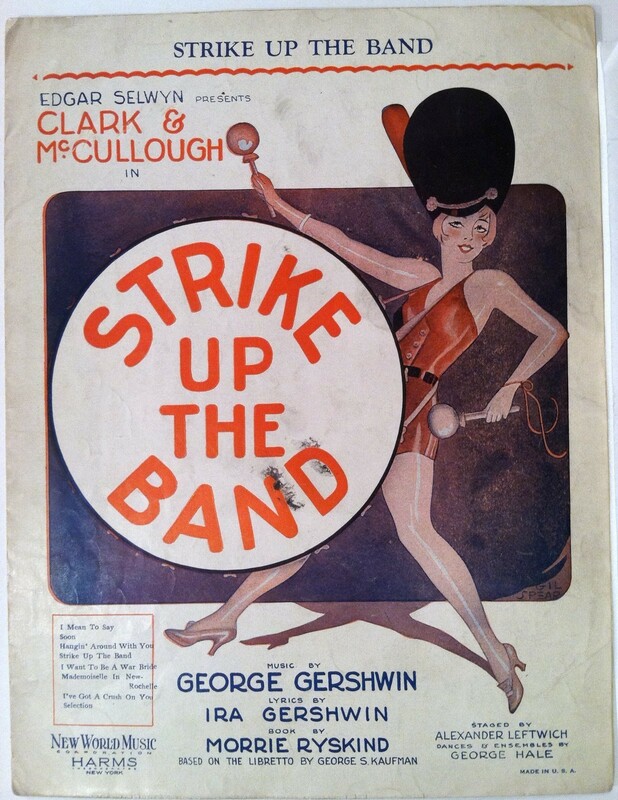 Amid cast departures once the show moved to Philadelphia in September of 1927, producers decided to close Strike Up The Band , hoping to put it back up with ample revisions in a few months. Those few months turned into a few years. During that time, Kaufman declined to continue with revisions, and Morrie Ryskind took over. The show resumed rehearsals in November of 1929 and finally opened in January of 1930 as a completely different show. The new plot had Fletcher owning a chocolate instead of cheese factory. Additionally, Joan and Jim’s romance was established before the curtain, eliminating their forced introduction. Meanwhile, two new parts were added for Bobby Clark and Paul McCullough, an old vaudeville team, who found themselves playing Jim’s investigative assistants. Fletcher learns that Jim and his cronies are trying to get Congress to repeal the chocolate tariff, and he collapses on his desk in a rage. The rest of the show proceeds as a dream of Fletcher’s, with Clark assuming the role of Holmes and McCullough playing Holmes’s assistant, Gideon. The story remains unchanged, with Gideon now competing with Holmes and Fletcher for Mrs. Draper (whom they think is wealthy). The entire war is now a dream. When Jim unmasks Sloane as a spy, Fletcher wakes up from his dream, gives his blessing to Jim and Joan’s nuptials and a triple wedding occurs. The ending remains the same, with Russia challenging a caviar tariff and Fletcher calling for action. 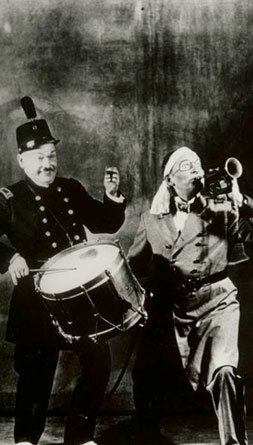 Though some of the crew was displeased at the softening of the satire in the revised book, New York critics praised the show and its story. Of course, it didn’t hurt that the score was completely overhauled and strengthened too. Of the numbers I mentioned from the ’27 score, only the title song remained. 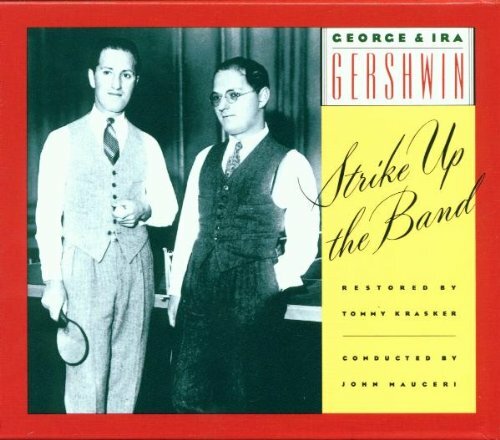 “Seventeen And Twenty-One” was replaced with the cuter, but less sweet, “I Mean To Say”, while Gershwin combined the melodies of two previously excised numbers to create the divine “Soon” for Jim and Joan, and gave Anne and Timothy another energetic duet, “Hangin’ Around With You.” In addition to new duets for both Fletcher and Draper, and Holmes and Gideon, the four got the snappy “How About A Boy?”, in which the three men compete both for her affections and the fictitious fortune. Also, “I’ve Got A Crush On You” from the 1928 flop Treasure Girl, covered here two weeks ago, was added as a second act duet for Anne and Timothy. With a much stronger score, a tighter book, and satire that wasn’t as bothersome, the new Strike Up The Band was a hit. Now, why is this my number one choice? In addition to the song highlights from both versions of the show I just mentioned, the score as a collective whole does a surprisingly strong job of connecting itself to the story and the characters. This seems particularly evident in the revised edition that toned down the satire and focused on strengthening the characters. Furthermore, I think the show is much more revivable than Treasure Girl or Pardon My English. The former’s materials don’t survive in full, and the latter’s looney plot is only tangentially related to the beauty of the score. 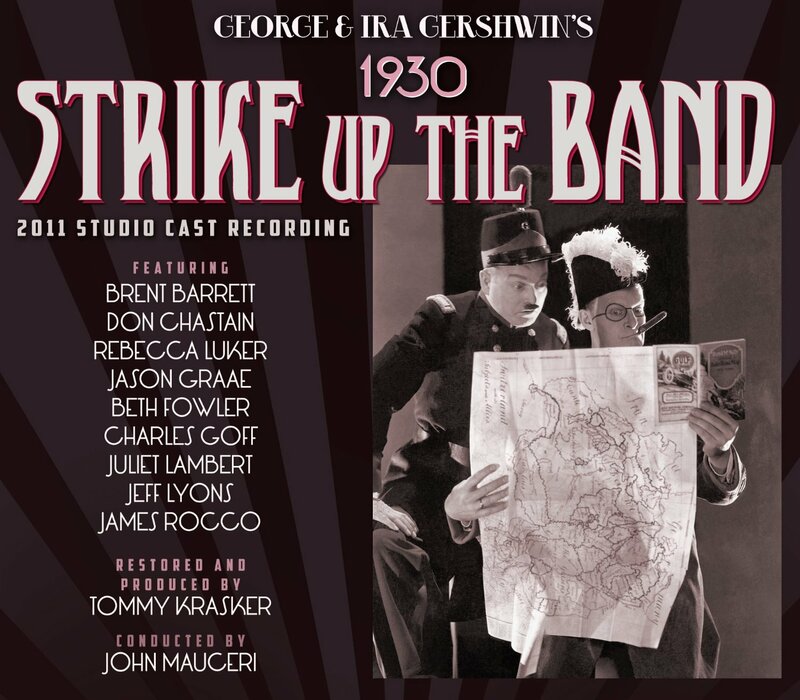 In Strike Up The Band, the songs work more closely with the action. And the plot, an obvious satire, could still be played with success today. The trick is not to eliminate its existence as a period piece. As I expressed weeks ago about all theatrical works: they are indicative of the times in which they are written. Even satires, which can prove universally relatable, is still a product of its time. Strike Up The Band is an antique, but it’s an antique that could play and play well. And with a score like this, it should definitely be played. Fortunately both versions of the score have been recorded, and productions based on Kaufman’s original script but incorporating the brilliant score from the revisal have been mounted by Encores!, Lost Musicals, and others. So this piece is being performed, but if I had my druthers, I would use the Ryskind book, a.k.a. the more successful one, as the basis of the show, and take songs and elements from Kaufman’s. Wouldn’t that make more sense? Especially since some elements — the tampering of uniform buttons and America’s sudden victory — are too farcical to be taken seriously with the show’s message. The dream device solves this problem, but doesn’t entirely negate the satire. There could be a balance. Regardless, the songs are incredibly worthy of a major revival. And the fascinating book, a period but still relatable satire, is worth a look too. Tune in next Musical Theatre Monday when I highlight another forgotten show. And come back tomorrow for the ten best episodes from I Love Lucy Season Six!